I am thrilled to be the new elementary PE Teacher and coach this year at AVCS. My background includes receiving my Bachelor’s degree in Kinesiology with an emphasis in Teacher Education. I love teaching PE and witnessing the joy that is found within movement and play! 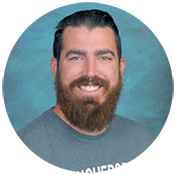 I began my teaching career as a PE teacher with Irvine Unified. I learned a lot during my time there and cannot wait to begin a new school year with your kids. I know God is going to bless this year with plenty of growth and learning. I have a beautiful wife, Cathy Shrock, who I have been married to for almost 3 years. We also just got a chocolate lab, Maverick, who has stolen our hearts. We live in Costa Mesa, but I grew up in Yorba Linda. I graduated from Eastside Christian School and am grateful to have the opportunity to now be teaching in a Christian School. I hope to provide the same positive experience and impact that I received. I love the outdoors and am willing to participate in any sport and any given moment.